Traditional chin augmentation involves the surgical implantation of a shaped silicone, solid chin implant under general anesthesia. The surgery generally involves up to two weeks of swelling and pain. The results can be good, but can also be limited by the shape of the prefabricated implant. 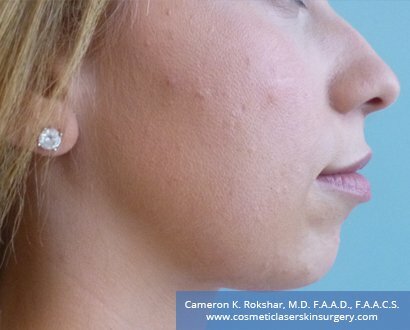 Dr. Rokhsar uses Radiesse injectable filler, rather than performing surgery for chin augmentation. A topical numbing cream is applied to prevent pain during the procedure. Small amounts of Radiesse are then injected into precise areas building up the chin and bringing your profile into balance. Results of non-surgical procedure are more precise because Dr. Rokhsar expands only the areas that are absolutely necessary for the optimal cosmetic result. Dr. Rokhsar is among the leading New York and Long Island Non-Surgical Chin Augmentation surgeons seen by large numbers of patients. The procedure is typically performed in 15 minutes following the application of numbing cream for 30 minutes. You may experience two to three days of minor swelling and rarely bruising. The results typically last up to a year. 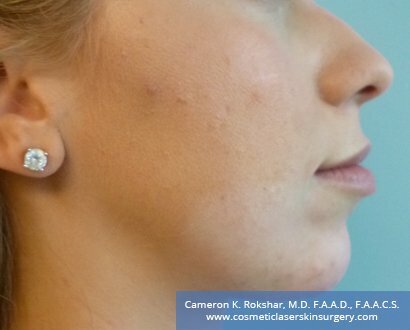 The clinical outcome is much more natural than chin implants as Dr. Rokhsar can follow the natural contours of the person’s own chin. The results can be subtle or dramatic depending on the patient’s wishes. Surgery carries inherent risks including scarring, infection, and anesthesia complications. 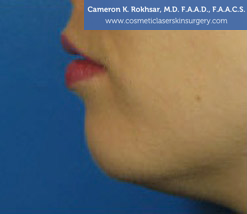 Traditional chin augmentation involves inserting a chin implant under general anesthesia. This implant can, rarely, move after surgery, having to be repositioned. If there is a significant infection after surgery, the implant must be removed. 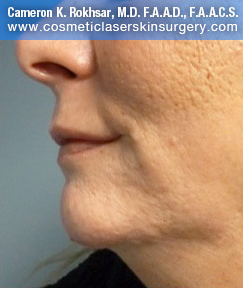 Non-surgical chin enhancement avoids the basic risks of surgery. There is no solid implant, therefore no risk of movement or infection. Radiesse does not move after it is injected and actually becomes part of the skin. Infections are unheard of with injection of Radiesse into this area of the face. 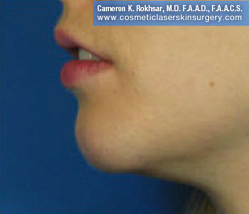 Recovery from traditional chin enhancement typically lasts seven to ten days and involves pain, bruising, and swelling. The majority of the swelling goes away after two to four weeks, but some swelling can last several months. If the incision was made inside of the mouth you will need to eat soft foods and use special procedures for brushing your teeth. Strong pain medication, ice packs, and special mouth rinses are required during recovery. 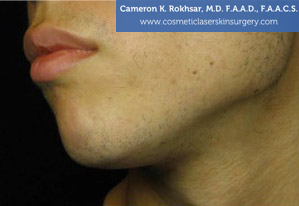 Non-surgical chin enhancement results in minor swelling and sometimes mild bruising and tenderness. These symptoms should last no more than two to three days. Since traditional chin augmentation involves inserting an implant, the enlargement cannot be completely customized to the shape of your face. It is possible for the implant to shift after surgery, which would give an undesirable look and require another surgery. 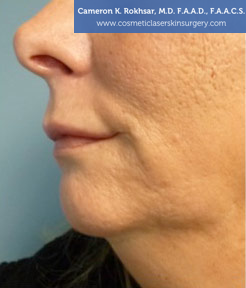 The injectable filler used in non-surgical chin enhancement is injected in small amounts and in precise locations so that there is total control over the shape and contours created by the procedure. Results last up to two years. Because the results are relatively temporary, adjustments can be made as your face changes over time, which allows you to maintain a natural look. 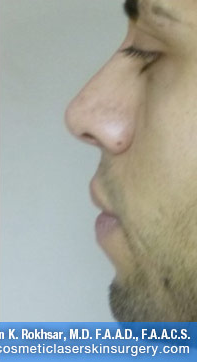 How is a non-surgical chin augmentation performed? A non-surgical chin augmentation utilizes the power of fillers such as Radiesse, and Juvederm. 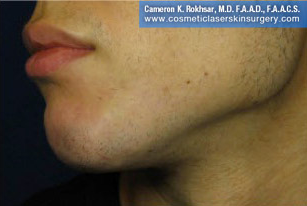 Either injection is placed into precise areas of the chin using a small needle. 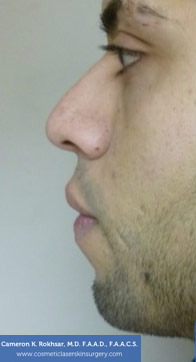 The results give patients an improvement in profile and face symmetry. The non-surgical chin augmentation is performed in two 15-minute treatments spread 3 to 4 weeks apart. Minor swelling and tenderness may last 2 to 3 days post procedure.